I think most folks have forgotten how easy it is to customize sound for many applications using the Control Panels, “Sound and Audio Devices” applet. I suspect most WinPatrol users aren’t aware that this feature is fully supported in WinPatrol and many other applications. It was a nice surprise when I realized how many people missed Scotty’s bark when it was broken on Vista. It’s fixed now and obvious to me that most people really like to hear some kind of audio feedback when they’re performing certain tasks. To customize your sounds, just go to the Start Button and select “Settings” -> “Control Panel”. Open the “Sound and Audio Devices” applet and click on the “Sounds” tab. In Vista’s control panel it’s called “Hardware and Sounds”. Besides changing your Windows Startup or Shut Down sounds, you will find a number of applications that may be customized. 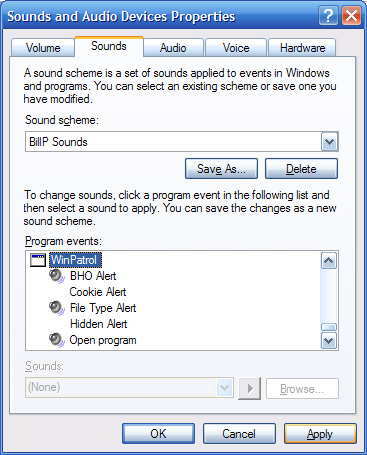 While this may come as a surprise to many WinPatrol users, this feature has been supported for a couple years. It was added at the request of some of our visually impaired users who wanted some additional feedback on what kind of alert was occurring. My sound has quit working on my computer. I just replaced the sound card a few months ago and it worked for awhile then stopped. I have been through the troubleshooting several times and it cannot find anything wrong with the device. Drivers are up to date. speakers are working. But no sound comes out. How do I fix this?? It is a Crystal Sound Fusion card. running on XP. sounds like your multimedia pci driver to your motherboard needs to be reinstalled. sometimes the motherboard does not always recognize you installed a card instead of the motherboards built in audio. bet if you plug your speakers in the old audio plug you will hear sound. I downloaded everest,(google it),it tells you what you have on your system and drivers. The basic home version is free and works well,this is how I solve alot of compatibility issues with pc's. good luck.